On this day, we left Porto in the morning and travelled to Lisbon, the capital of Portugal, which is 320 km in the south and the time for the journey would be 3 hours 30 minutes. When we arrived at Lisbon, Maria, a local tour-guide welcomed us and brought us round to see a few historical landmarks. 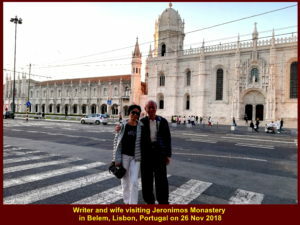 The first historical landmark Maria brought us to see was Jeronimos Monastery which was a few hundred metres from River Tagus in Belem, Lisbon. The monastery was constructed in 1506 and completed 100 years later. 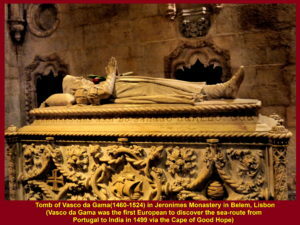 The construction was started by King Manuel I of Portugal(1469-1521) and funded by taxes on goods imported from overseas. The monks of the Order of Saint Jerome at the monastery gave spiritual guidance to sailors during the “Age of Discoveries” and prayed for the King Manuel I’s soul. The monastery has a church, Church of St. Mary, adjacent to it. 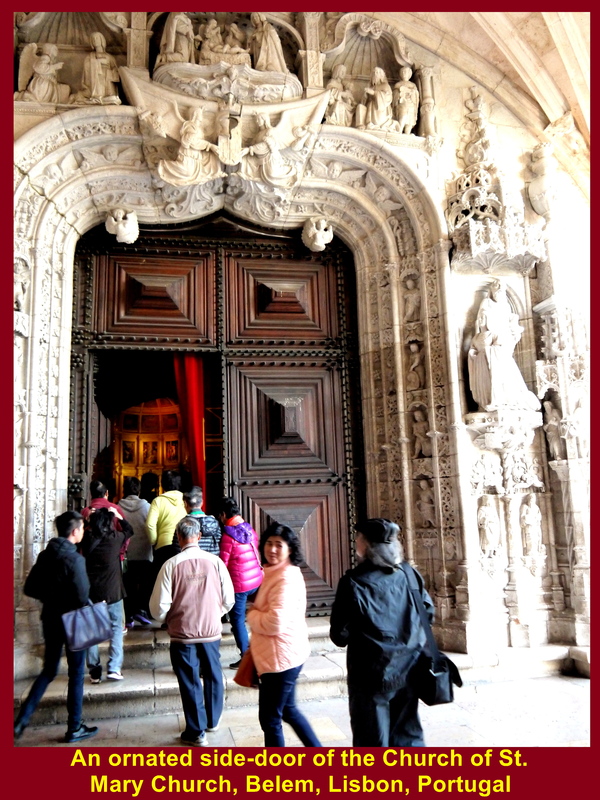 The southern entrance of the church is beautifully decorated with statuettes of saints. 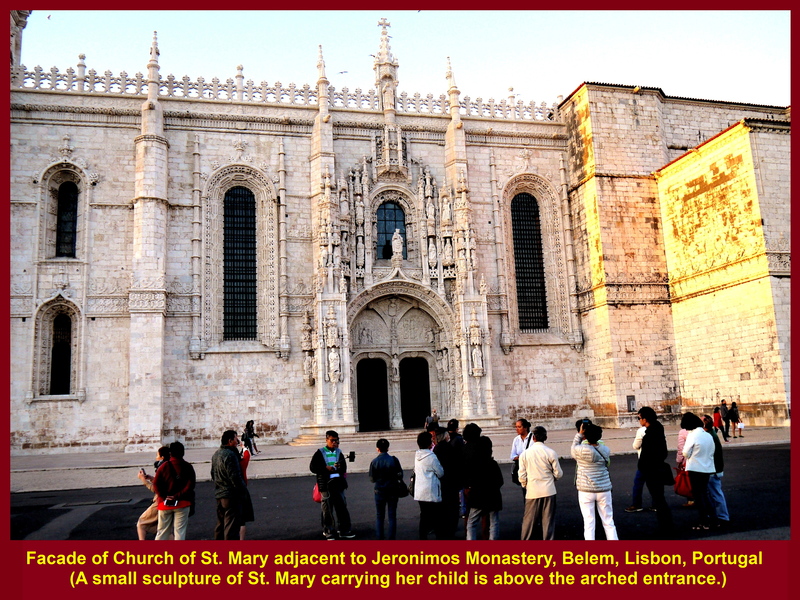 The western entrance of the Church of St. Mary is also beautifully decorated with statuettes of saints. 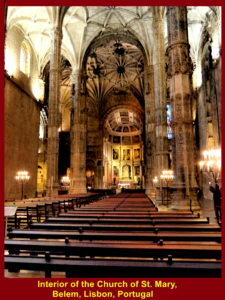 The nave in the church is long and the ceiling is high. 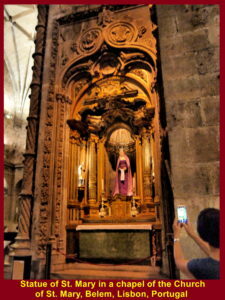 There is a chapel in the church that is dedicated to St. Mary. The worshipers believed that St. Mary brought back the sailors home, safely, during the “Age of Discoveries” from 15th. until 17th. Century. 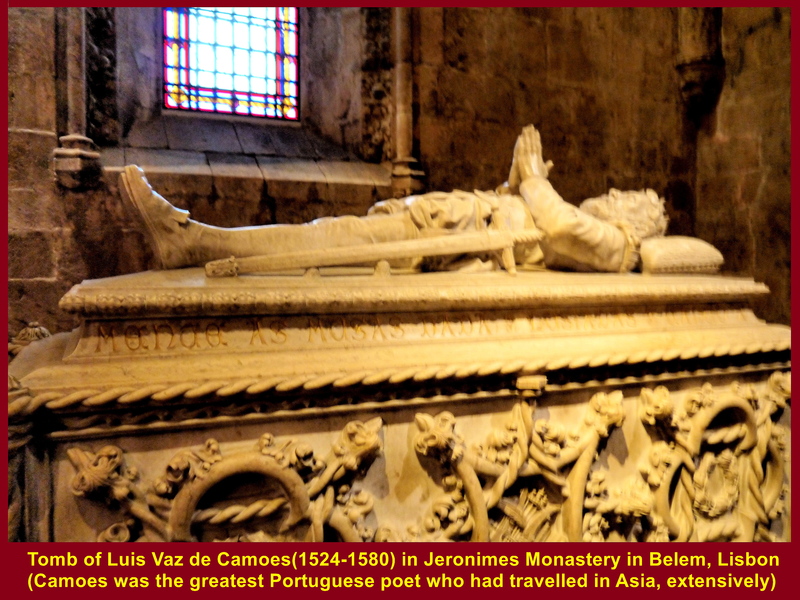 In the church there are tombs of famous figures and royal members, such as the tombs of Vasco da Gama(1460-1524) who discovered a sea route to India in 1498, Luis Vaz de Camoes(1524-1580) who was a famous Portuguese writer glorifying the triumphs of Vasco da Gama, King Manuel I(1469-1521) and King Sebastian(1557-1578) to name a few. 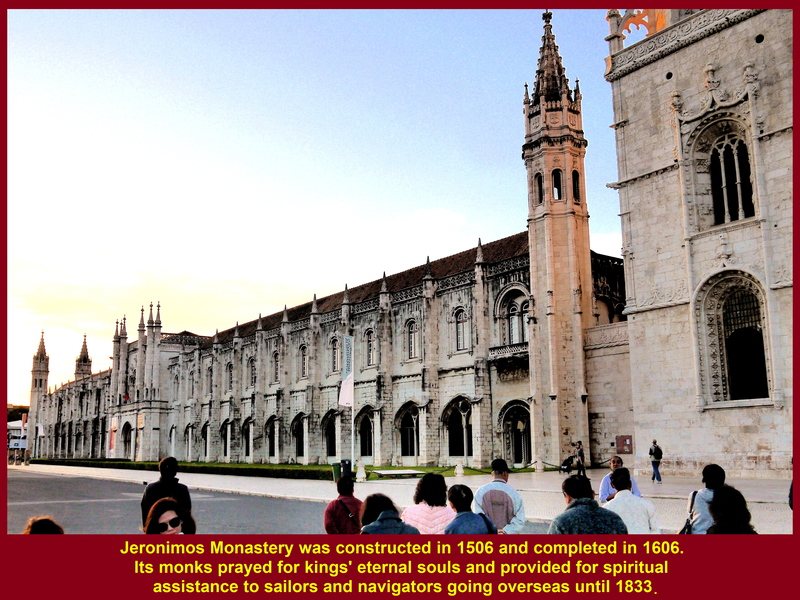 In the west wing of Jeronimos Monastery is a long building that houses the National Archaeological Museum and Maritime Museum now. 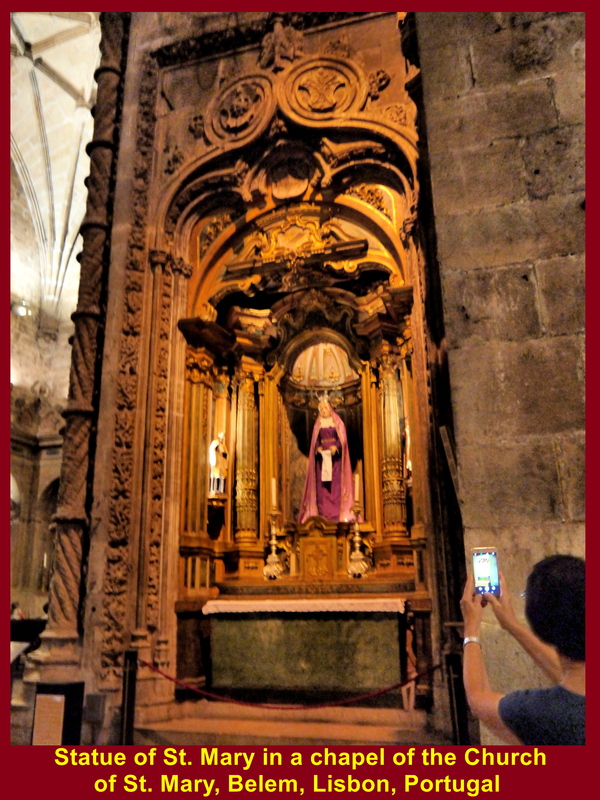 Then we left Jeronimos Monastery and went to see a huge monument erected on the riverbank of River Tagus in 1939. It is a few hundred metres from the monastery. 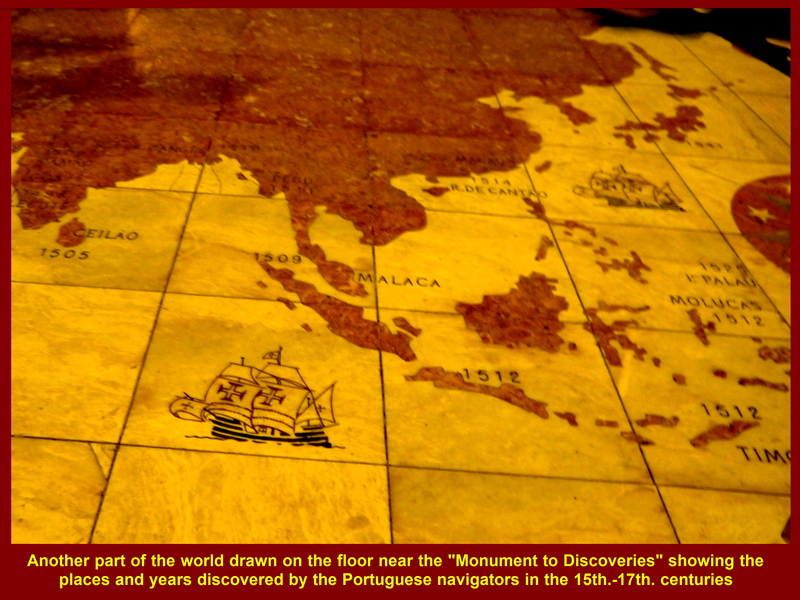 It is known as Monument to Discoveries created in memory of the brave Portuguese navigators who went overseas to discover new foreign lands in the 15th.-17th Century period. 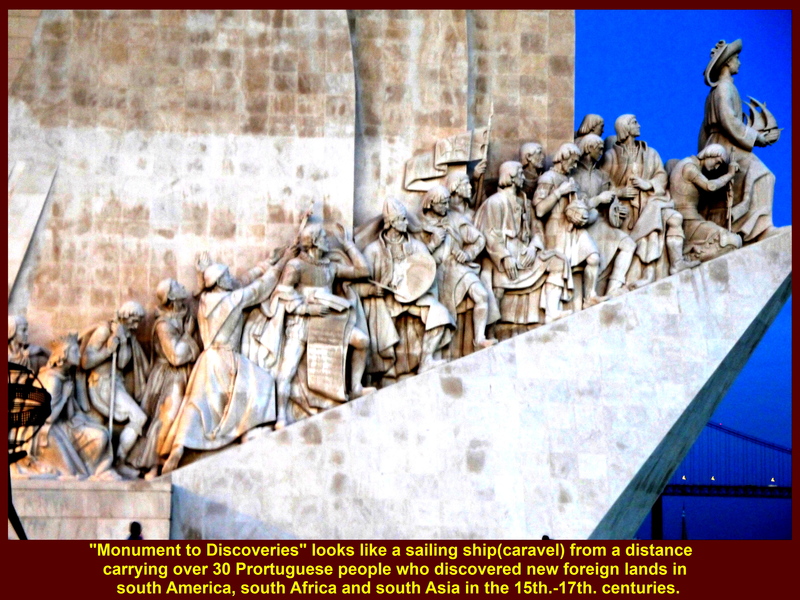 It looks like a caravel, a Portuguese traditional ship, carrying the Portuguese people to new foreign lands in South America, Africa and South Asia. 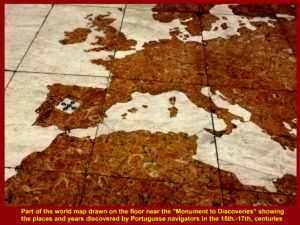 On the floor in front of the Monument to Discoveries, there are two large maps. One is showing the places and years in America and Africa, and the other South Asia discovered by the Portuguese navigators in the 15th.-17th. Century period. 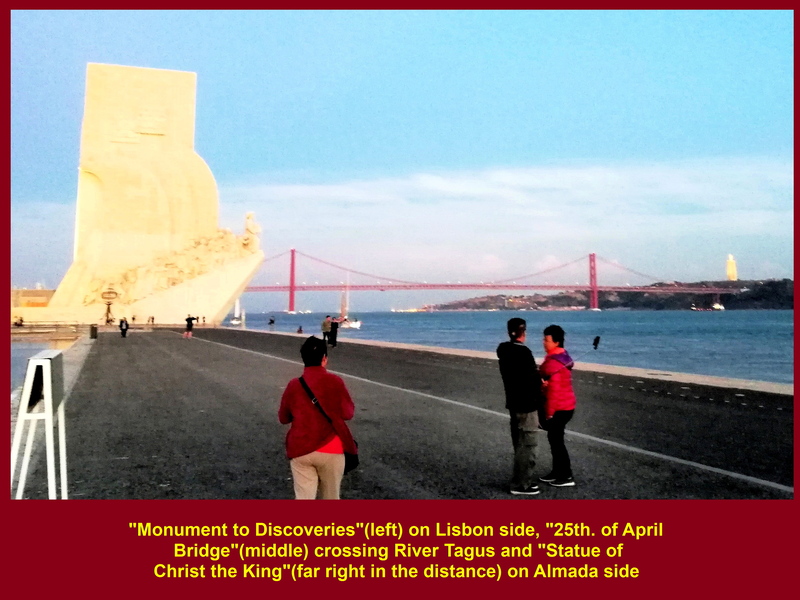 Standing at a spot on the bank of River Tagus, a visitor can see three main structures, viz. Monument to Discoveries on the left, 25th. April Bridge over River Tagus and large, white Statue of Jesus the King in the distance on the right. The 25th. April Bridge is a 2277 metre-long suspension bridge that looks like the one in San Francisco in California. It has two decks. The upper deck carries six car-lanes and the lower one carries a double track railway. When the bridge was opened in 1966, it was called Salazar Bridge. Then in 1974 it was renamed “25th. April Bridge” in commemoration of the Carnation Revolution. The revolution was a military coup organized by the Military Forces Movement to overthrow the authoritarian regime of Estado Nova on 25th. April 1974. 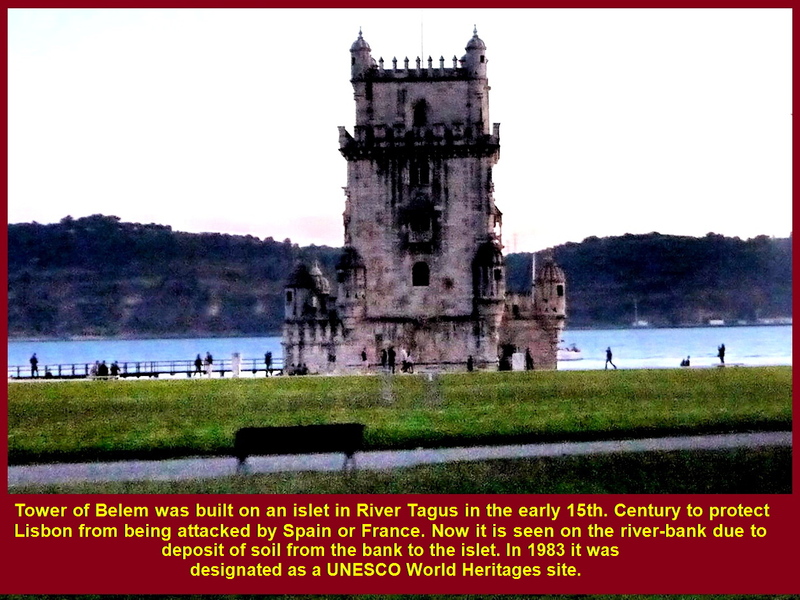 A 30 metre-high fortress was built on an islet in River Tagus in Belem in the early 15th. 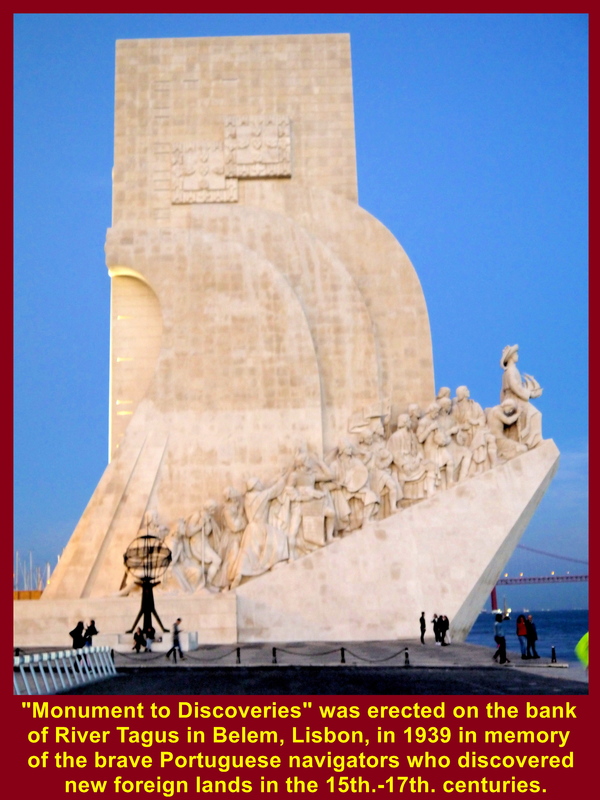 Century to protect Lisbon from being invaded by Spain or France. 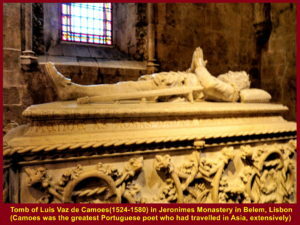 Built in Portuguese Manueline style, it is known as Tower of Belem or Tower of St. Vincent. Owing to the deposit of soil in River Tagus, the fortress is now seen to be on the bank of the river. In 1983 Tower of Belem was designated as a UNESCO World Heritage site due to its important role it played in the Portuguese Age of Discoveries. Tower of Belem built in the early 15th. Century to protect Lisbon from being attacked by France or Spain. 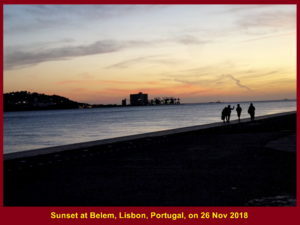 It was sunset when we were going to leave Belem, a historical maritime place in Lisbon. Before we left Belem, we had a last look at the river-mouth of River Tagus in the west. In the distance, we saw a silhouette of a larger fortress against the colourful sky at sunset. 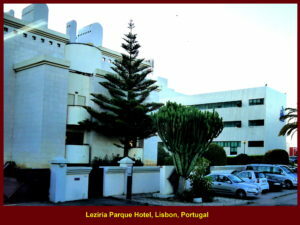 It is near the port of Lisbon. 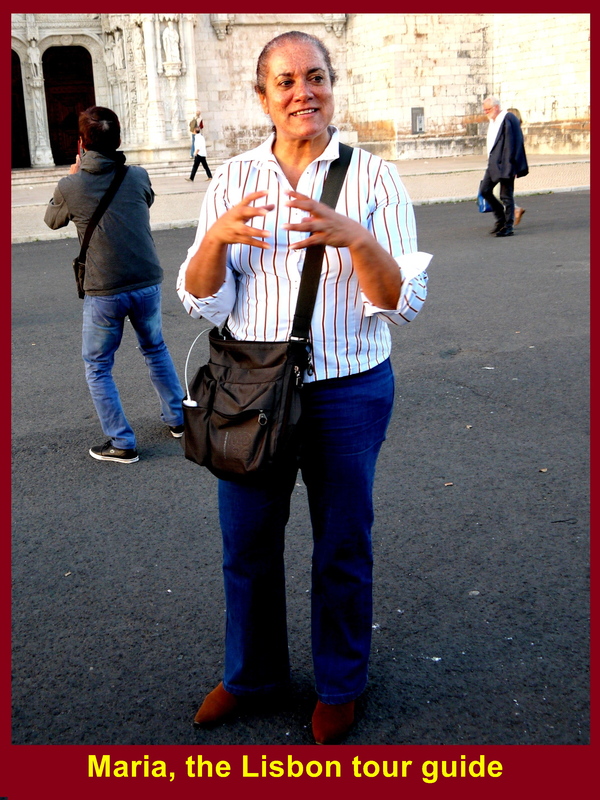 That fortress is known as Sao Juliao da Barra. 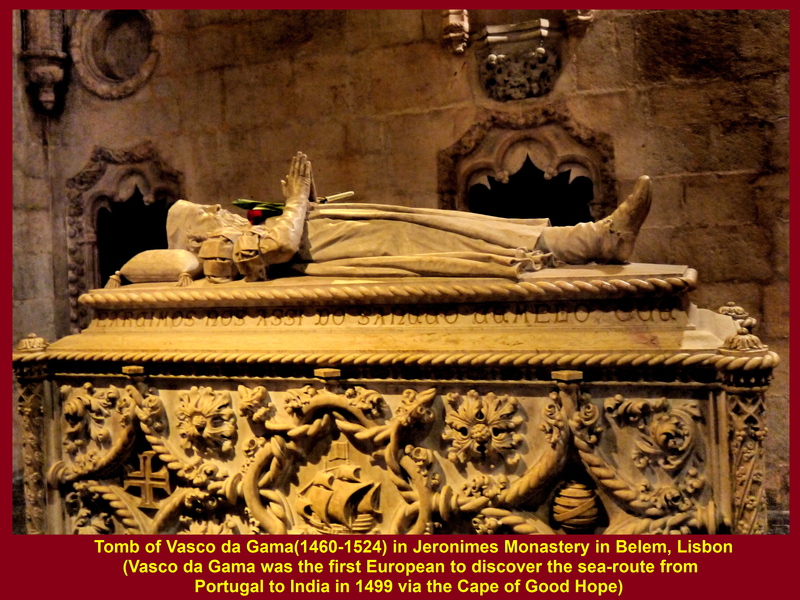 In 1556 King John III of Portugal(1502-1557) ordered the fortress to be constructed at the mouth of River Tagus to protect the Lisbon port and city from being attacked by foreign invaders. Soon we left Belem for dinner and stayed at a hotel for a night, Hotel Leziria Parque, in Lisbon. 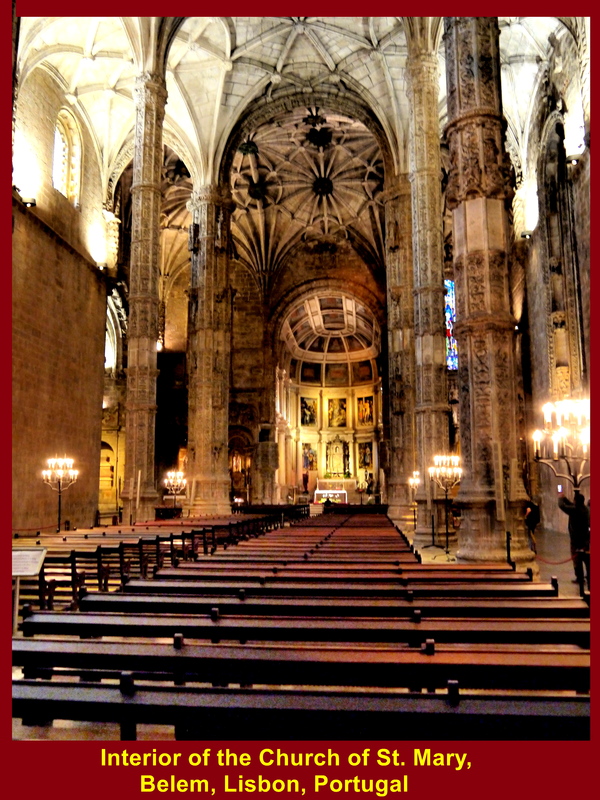 We would be going to Seville in Spain the following day. 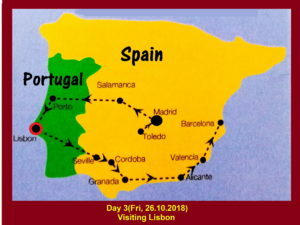 It is 450 km south-east of Lisbon and the journey would take 4 hours 30 minutes.